Junior student, Neil Marek, received First Place Award with a $5,000 scholarship for his interview suit design in the 23rd annual Hispanic Association of Colleges and Universities (HACU) conference on November 01. The competition took place in Orlando, Florida. HACU is dedicated to the promotion of higher education amongst Hispanic and diverse background students. The purpose of the conference is to bring together students organizations from all over the country to create networking opportunities and general information sharing. 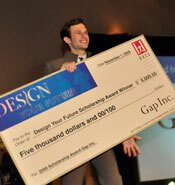 The Design Your Future contest was presented by Gap Inc., LATINA Style magazine and the HACU. The objective was to design and construct an interview suit that the designer would be wearing. Five finalists were chosen from the nationwide design search for attending the conference in Orlando where the designers showcased their designs for an audience of HACU conference attendees and three judges. The judges were Antoine Andrews - director of diversity and inclusion Gap Inc; Erin Herrera - senior recruiter Old Navy, and Melinda K. Adams - Assistant Professor in Fashion Management at the University of the Incarnate Word. Neil along with the other contestants will be featured in an article in a major Hispanic publication. For more information about the competition, visit http://www.hacu.net/hacu/Design_Your_Future1_EN.asp?SnID=954405075.